I've made a list with most of the easter eggs Pixar hides on its movies. shows up as a mime who's working in the streets of Paris in "Ratatouille"
... is also where Randall ends up after he gets kicked out from the monster's world in "Monsters, Inc."
is the same who repairs Woody in "Toy Story 2." is the sponsor in "Cars." The credit goes to Jim Hill for finding all this stuff. Cool findings, those guys are always teasing us and we don't even notice it. I love Pixar, you can't say a single negative thing about all the movies they made. Except Cars. if you look at the truck stop where mack wants to stop you will see a truck with a Monster inc logo on it. Here is another One! There is a short with a baby that is playing with a musical toy. You can see the ball in that short as well it is on the floor! it is also Painted on the floor in another short with a unicycle. You see it when the spotlight hits it. Love the Easter Eggs...Thanks for sharing! 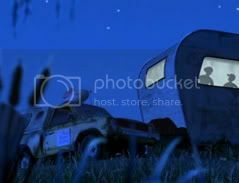 Pixar stated that there is, in fact, no pizza truck in "The Incredibles" the one you showed is a common misconception, other than that great easter eggs. Buzz Lightyear is found in the toy box in the dentists office in Nemo.